Odie, (top) and Snow (bottom) recently lost their home due to a very sad divorce situation. They are great friends and would be happiest if adopted as a pair. Odie is a four-year-old male ragdoll mix with flame-point Siamese markings weighing in at 18 pounds! He will need to be brushed on a regular basis but will reward you with lots of purrs. Snow is a two-year-old flame-point Siamese male weighing in at 15 pounds. He is very vocal, friendly and has the most beautiful blue eyes! Both are good with other cats and calm dogs. Please help SCP keep these sweet boys together. For more information email pets2adopt@yahoo.com or visit www.secondchancepets.org. SCP is also already planning it’s 2012 Silent Auction/Dinner Fundraiser. If you or your business would like to underwrite a portion of the annual event or if you have items to donate please email jmax7@comcast.net. SCP is a 501(c)(3) non-profit animal welfare organization. All donations are tax-deductible. Great news! Odie & Snow have been adopted together! The brothers have a forever home with 2 little human brothers! Thanks, BAHM for featuring these deserving pets. To view their new family go to the secondchancepets.org homepage and scroll down to the Happy Tails slideshow! 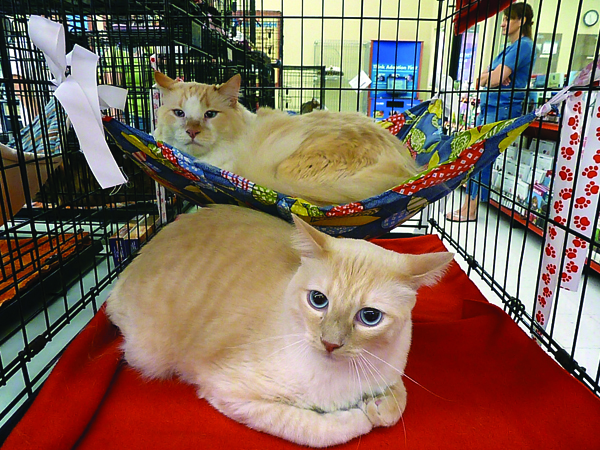 Great news…Odie & Snow have been adopted together! Thanks, BAHM for featuring these deserving cats. Go to the secondchancepets.org homepage and scroll down to the “Happy Tails” slideshow to see their new, forever family!